Yesterday I joined my Sagebrush Habitat Ecology class on a field trip to help restore a piece of land which has seen its fair share of abuse. This land has been grazed, cleared for agriculture, and left for dead. As with most abandoned land, dead would be better than what actually occurs. When the native plants and animals are removed, the land is quickly overtaken by invasives - most notably cheatgrass, medusahead and tumble mustard. The land we were working on is part of a private ranch which has been purchased by an individual with a history of restoring lands. They are interested in restoring this portion of the land as both Greater Sage-Grouse and Columbian Sharp-tailed Grouse occupy nearby lands. The hope is that this habitat could one day be occupied by these species which are both in critical need of increased habitat availability. The restoration project began last fall when the land was cleared. After clearing, an herbicide was applied to kill all annual grasses most of which are invasive. I am usually against herbicides due to the potential impacts on animal life, but cheatgrass has proven immune to most all other methods. Following this treatment the land was seeded with a subspecies of Big Sagebrush which grows well in the area, native bunchgrass, and a variety of forbs. Unfortunately Antelope Bitterbrush, a native member of many sagebrush habitats, does not grow well from seed. Our task today was to plant 2500 Bitterbrush starts. The planting process involves drilling holes with a post hole digger. A few hours on this torture machine will definitely leave a mark. I guess that I will still be feeling it come Wednesday! Even though the herbicide had been applied, invasive grasses are already sprouting in the area. Dr. Forbey takes a turn. Two post-hole diggers proved about right to keep up with 12 people burying starts. We averaged about ten holes per minute. The burying process required care with the roots to ensure the tips point down and are not damaged by rocks in the soil. With the strong wind today we had to ensure the roots of the plants did not dry out by keeping them rolled in wet burlap. After about 5 hours we planted the 2500th start. What a day. The crew surrounding our final start. The crew chief estimates that 80% of our starts will survive. If so, this habitat will be much closer to what the native species in Idaho expect. I hope some day this land will be occupied by a grouse, possibly even a lek. It will take another decade or longer until we will know. Unfortunately, there is a lot more work to do, even on this piece of land. 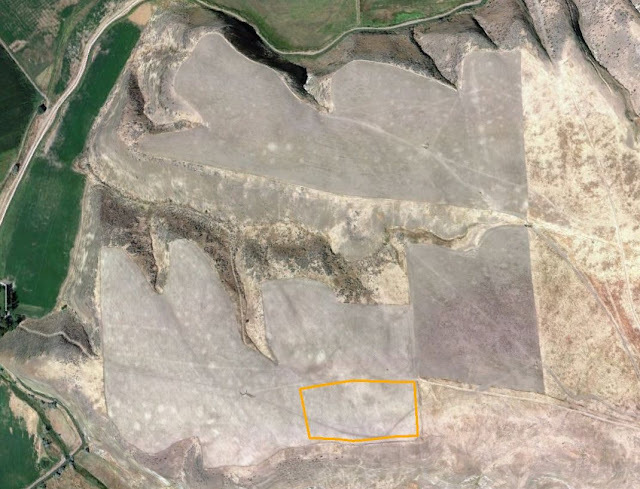 The orange rectangle represents the land we covered today.The remaining cultivated portion is planned for restoration during the next two years. The uncultivated land to the right is a problem as it consists of 100% invasives. I am not sure what can be done with that. we had a guest botanist from the BLM today in my Principles of Fisheries and Wildlife Management class to talk about sagebrush steppe habitat, and it is pretty sad to see all of this habitat be destroyed so easily.